Prof M Kodandaram warns Telangana's education system will collapse if private varsities are allowed. Why? The Telangana government is allowing private players to set up universities in a state where 90% of the population belongs to socially and economically backward groups. Reliance has plans to set up a varsity in Hyderabad, eyeing an education market valued at $100 billion in 2015-16, with higher education making up 59.7% of the market size. But Mukesh Ambani's company and others can do so only after Telangana passes a legislation allowing and regulating private varsities as required by the University Grants Commission rules. For the past few months, the Telangana Rashtra Samithi regime of K Chandrasekhar Rao has been working on just such a legislation. On 10 December, the cabinet approved the draft Private Universities Bill, though it was referred to a cabinet sub-committee to finalise the norms. Despite the dismal condition of Telangana's universities and protests by students over the past two weeks, the KCR government intends to introduce the bill in the ongoing winter session of the legislative assembly, which was supposed to close on 30 December but it is likely to be extended. There is a chance that the bill - originally supposed to be introduced in the assembly's budget session in March - could be delayed again. Sources said the cabinet sub- committee headed by Deputy Chief Minister and Education Minister Kadiyam Srihari was unwilling to introduce the bill in its present form. There have been reports of divisions within the TRS itself, between those who want full autonomy for the private universities and those, apparently including KCR, who want stricter regulations as well as reservations. The contents of the draft bill have not been made public so far. As the bill has taken shape, student organisations like the Telangana Vidhyarthi Vedika, Progressive Democratic Students Union, Students Federation of India and All India Students Federation have been protesting on the ground that it would make higher education unaffordable for the masses. The major centres of the student protests have been Osmania University in Hyderabad and Kakatiya University in Warangal. In Hyderabad, students from several districts turned up for the "Chalo Assembly" protest on 23 December, agitating in multiple batches outside the assembly and other areas. Nearly 200 students were detained but later let off. But the strongest opposition to the legislation comes from a key architect of the Telangana movement - Prof M Kodandaram, president of the Telangana Joint Action Committee, which comprises political and non-political groups that came together in 2009 in the last leg of the decades-long struggle for statehood. On 19 December, Kodandaram held a meeting with all opposition political parties in the state, and they promised to oppose the bill should it come up in the assembly. Kodandaram and KCR were once allies in the Telangana movement. A former professor of political science at Osmania, Kodandaram acted as a guiding force for the TRS. Since then, however, their paths have diverged. Even before Telangana became India's newest state in June 2014, KCR had been promising "free education from KG to PG" for all - a pledge reiterated in his election manifesto. The promise has not seen much progress, except for the recent announcement that around 250 special schools for some disadvantaged communities would be set up. KCR has continued the "fee reimbursement scheme" - introduced in the erstwhile united Andhra Pradesh by chief minister Kiran Kumar Reddy in 2012 - for students belonging to socially backward groups. Students from such groups who pursue professional courses after clearing entrance exams like Eamcet (Engineering Agricultural Medical Common Entrance Test) are supposed to get their fees reimbursed by the government. While students who secure up to the 10,000th rank are to get their full fees reimbursed, those after that rank get a fixed amount of Rs 35,000. But the fees for 2015-16 and 2016-17 are yet to be paid. More worryingly, recent reports claim the government plans to cap the reimbursements at Rs 40,000 per student irrespective of the rank. As for state-funded universities in Telangana, they are all facing a crunch of funds, faculties and facilities. The three central universities - University of Hyderabad, English and Foreign Languages University, Maulana Azad National Urdu University - are also short of funds but the situation is not as bad. In Osmania alone, there are around 1,200 faculty positions but only around 550 permanent teachers - less than 50%. Kodandaram pointed this out while speaking to Catch, "This bill is being introduced at the most inappropriate time as the education system in Telangana is in deep crisis. Almost 50% of teaching positions are vacant in government colleges and universities throughout the state. All universities are facing a major crisis of funds. There is massive inequality in the access to good higher education." 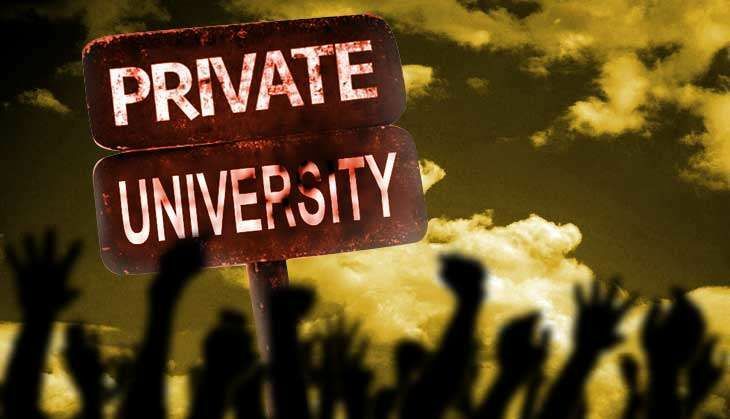 "If private universities are allowed at this time, the system will collapse. Students from weaker sections - SCs, STs, OBCs and minorities - who form the bulk of the population will not be able to afford the steep fees charged by private universities," he said. Nazeer, a PhD student at Osmania and member of Telangana Vidhyarthi Vedika, agreed, "A majority of the people here are farmers. Almost 90% of the students are from deprived backgrounds, and most are first-generation learners. Private universities will only further distance higher education from the common people." Rehman, a postgraduate student at Osmania and member of All India Students' Federation, said, "Lack of education and employment were the main reasons we fought for a separate state. KCR had promised us free education from KG to PG, but he is giving in to corporate pressures. The private sector only works for profit. Look at the effect of privatisation on healthcare in the country. How will the people afford it?" He continued, "The state universities are already in a terrible state. Many departments have shut down because of lack of faculty. The government should strengthen state universities, introduce new courses, fill in faculty, build infrastructure, and not open it up for profit." While 22 states have passed laws allowing private and deemed universities, Telangana is among the few that have not, so far at least. Private engineering colleges and other professional institutes proliferate, however - of the 266 engineering colleges in Telangana, only 17 are government-run. Last year, Andhra Pradesh too introduced the AP Private Universities (Establishment and Regulation) Act, 2015. But then Telangana has a much higher proportion of socially disadvantaged population than Andhra, and this population remains economically weak as well. Even in terms of literacy, Telangana ranks 32nd in the country with a literacy rate of 66.46%, while Andhra Pradesh has a literacy rate of 91.1% and ranks fourth.